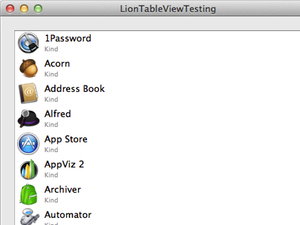 With OS X 10.7 Lion, Apple has introduced many cool features to it’s AppKit. 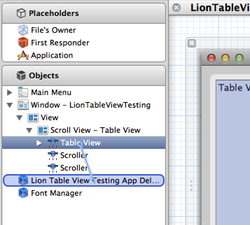 One of those that caught my attention right away, was view based table views. 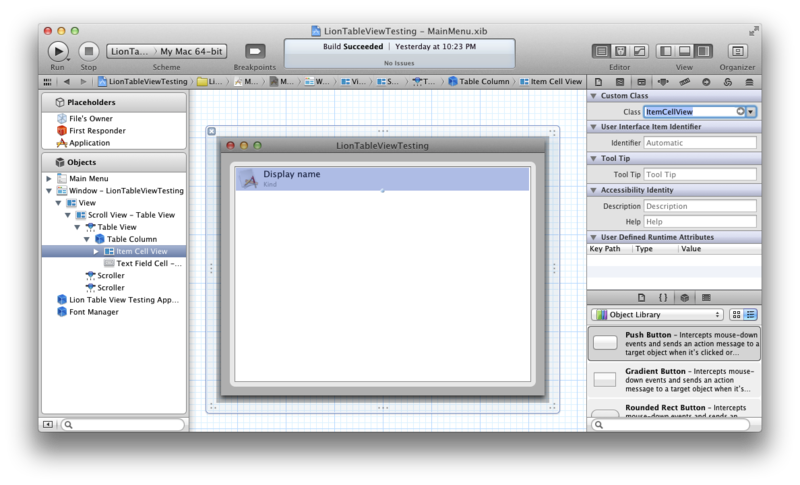 It seemed like the missing widget I was looking for when implementing Startupizer’s items list. So I decided to take a spin as a research for directions for 2.0 release. 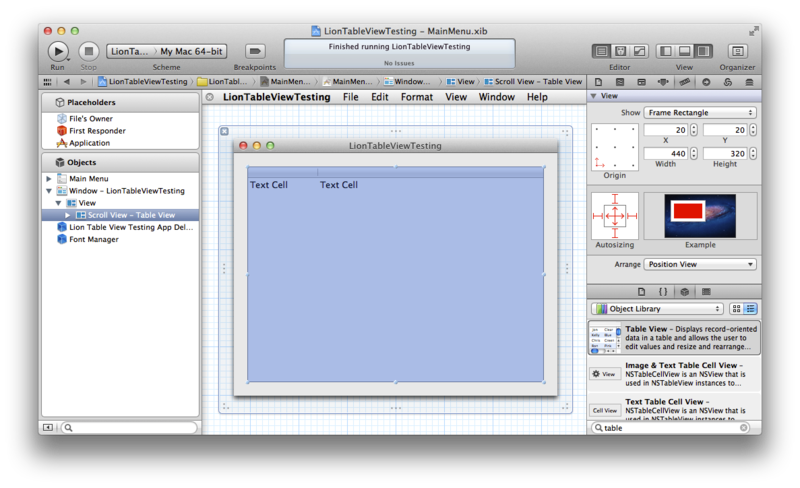 In this post, I’ll go step by step through a small project gradually adding features until it will look similar to current main window. 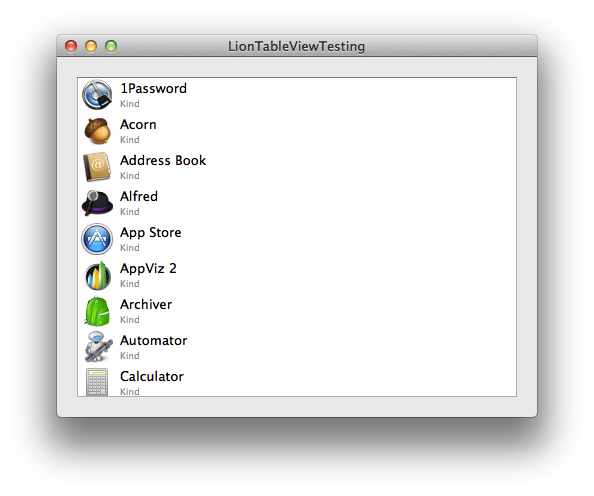 The application we’ll build will scan your Applications folder and will use table view to display icon, name and type of the item. 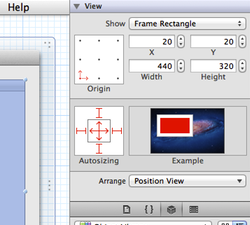 The model layer is quite simple: is consists of an array of Item objects, each object representing a single application. I’m not going to explain the code here, take a look at the sample code below if you’re interested. This post assumes you’re accustomed to cell based table views, controller classes and bindings. If you’re just looking for quick reference, just go over steps at the start of each chapter, but if you’re more on the beginner side, feel free to read through the rest of it - I also did my best to explain some of the reasons and alternative methods in there. 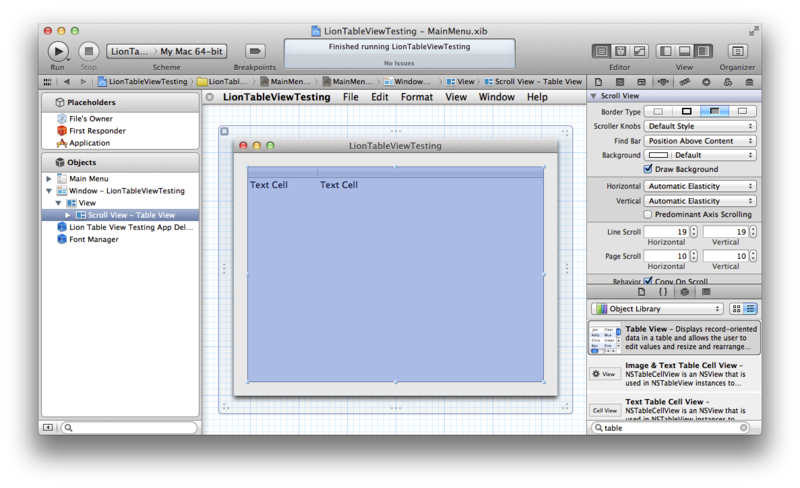 Note that I use expanded layout as I find it simpler to drill down view hierarchy once it gets more complex. 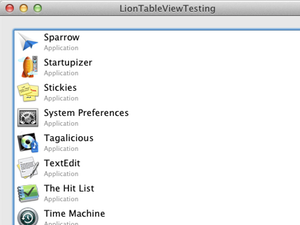 I only have navigators and utilities views visible when I need them. 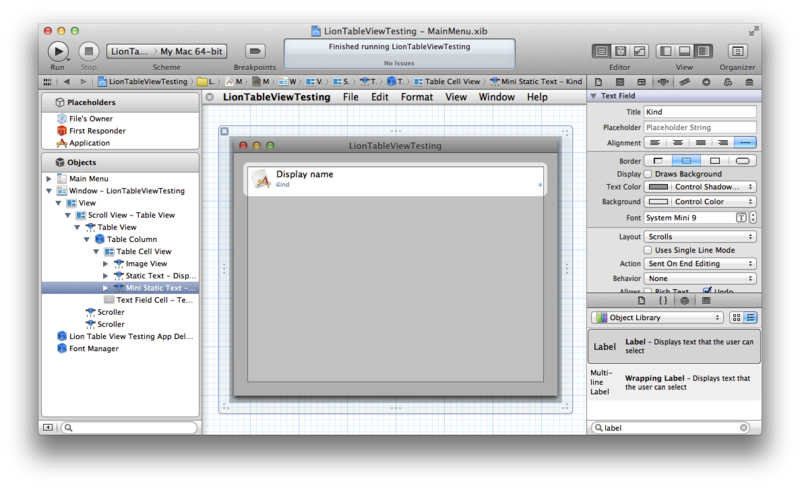 In fact, I’ve setup behaviors to automatically show and hide appropriate navigators and utility views when performing various actions such as building, debugging etc. 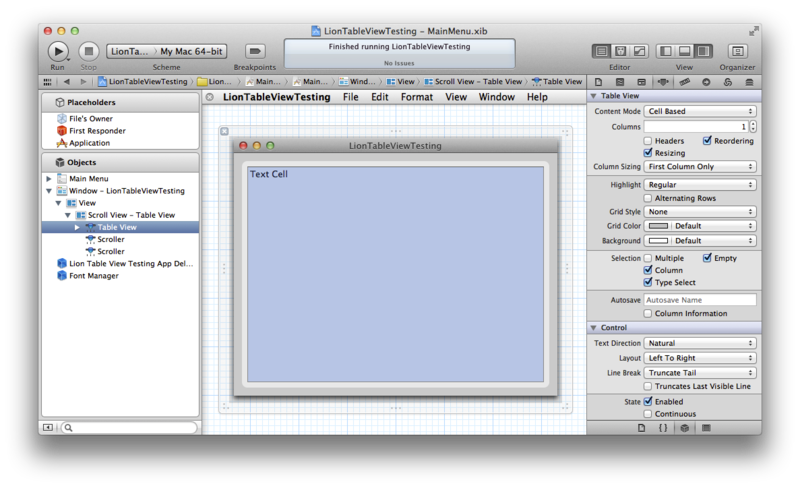 If you’re not familiar with this, I suggest going over Maximizing Productivity in Xcode 4 WWDC 2011 video to get to speed with this great feature. 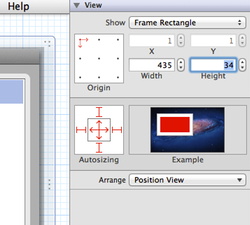 Note that I used the old style auto resizing masks here for simplicity. 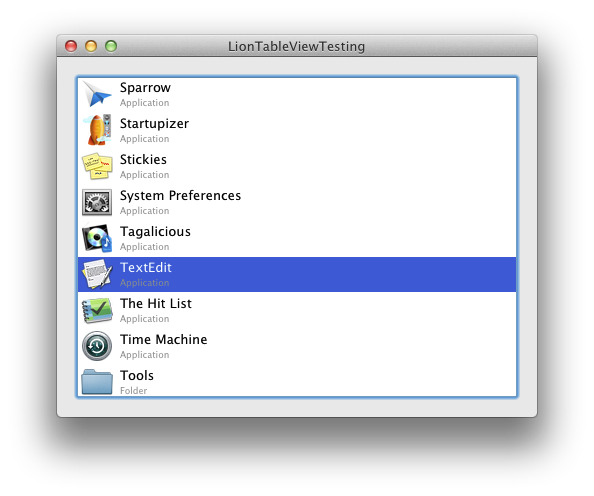 If you’re targeting Lion, you should definitely have a look at auto layout, it’s much more advanced, but it would distract us from the main goal here. Perhaps I’ll write about it in a future post. 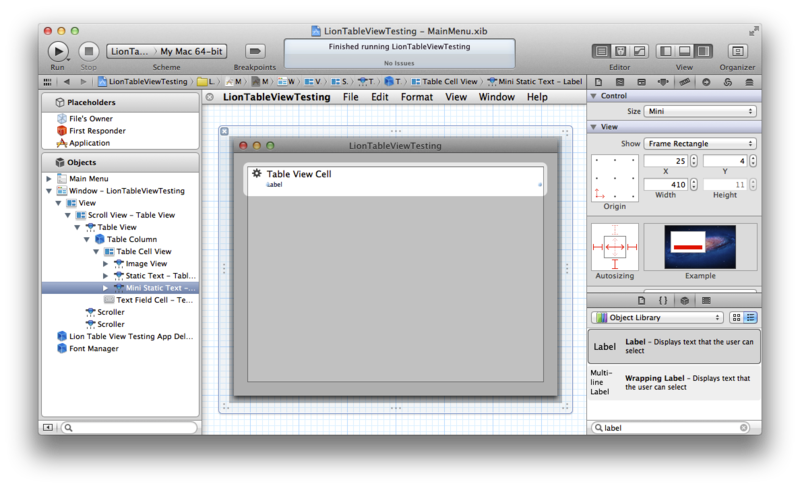 Note that using default cell view has several additional advantages over custom view. 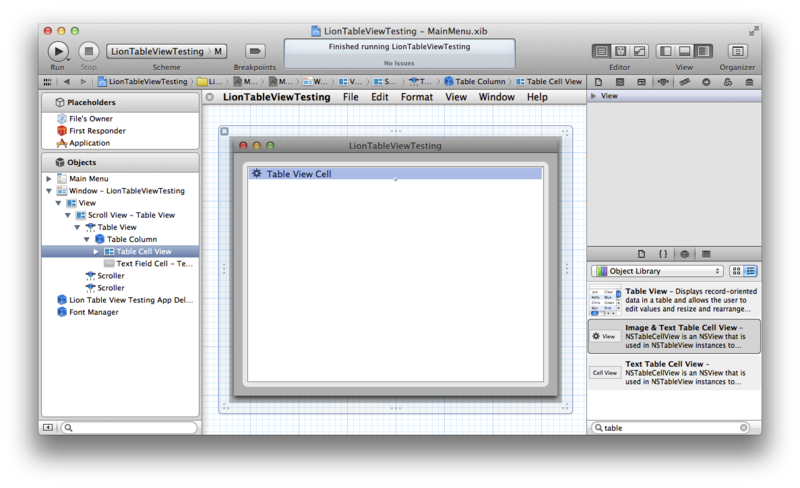 Among others, NSTableCellView already provides textField and imageView properties linked with the cell you dragged to your table view. 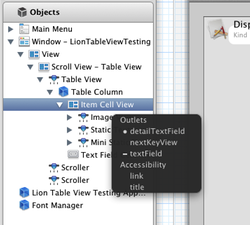 Additionally, these two are already setup as hints for accessibility. 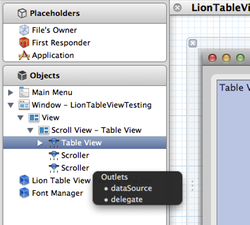 Note that for the sake of this tutorial, we don’t need the table view instance outside the data source and delegate methods, so we don’t have to setup IBOutlet, but in most real apps, you’re likely need to do this step too, the most common scenario would be to reload the table when model changes. 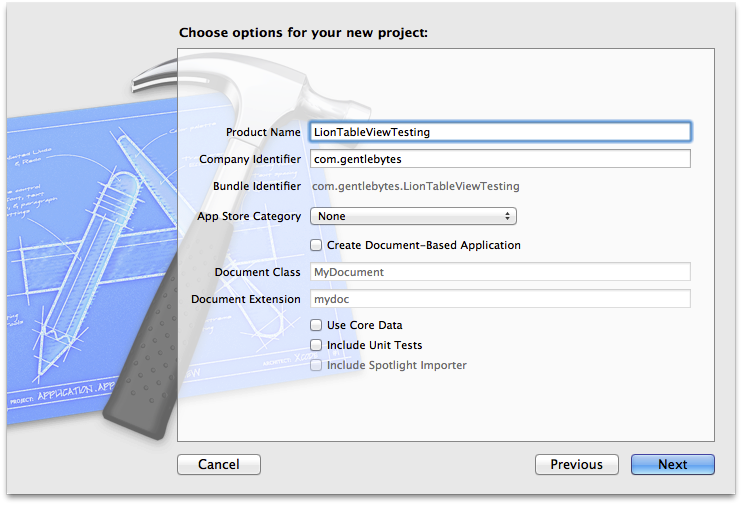 Note that these methods are not needed when using bindings. 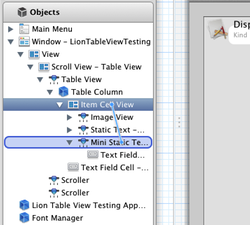 In fact, you’ll see how much we can simplify the code when changing to bindings later on! Cool! 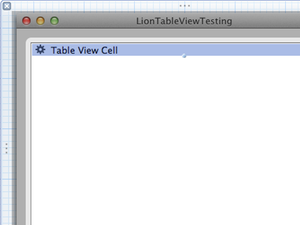 And that’s all it takes to have our simple custom view based table view! 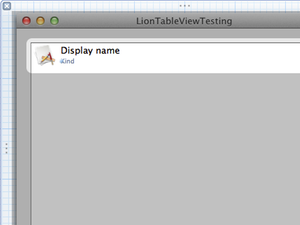 Check LionTableViewTesting1 project to see the whole source code. Noticed word “simple” at the end of previous chapter? No? Well, doesn’t matter, here’s the deal - our app looks fine, but closer examination shows an issue: detail labels all show text “Kind”, but our Item class should return either “Application” or “Folder”. So the text from IB remains. 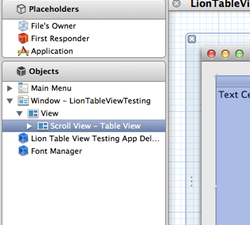 And sure enough, we didn’t set the kind string to details text field in tableView:viewForTableColumn:row:… Let’s remedy this. Simple enough. 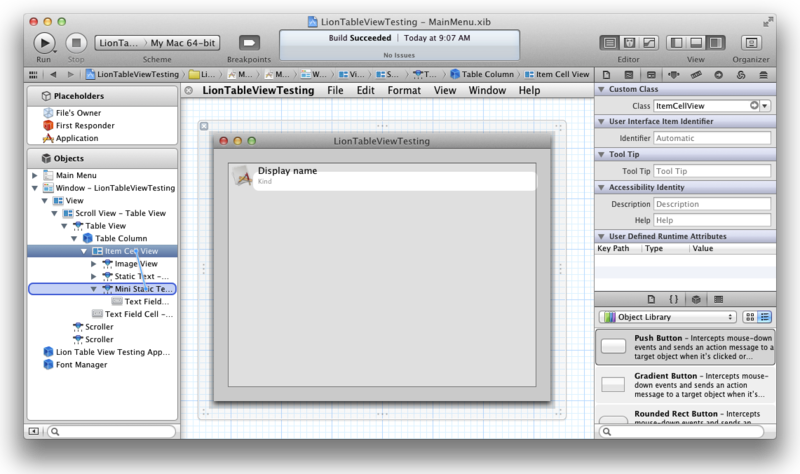 Notice how everything was done using the same methods as we used previously: even though there’s whole new API for dealing with view based table views, we can construct and wire them using the same IB and Xcode concepts as before! 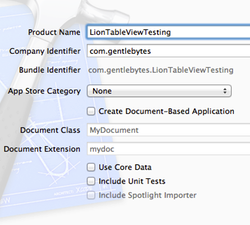 This is a one big argument to why Apple’s SDK is (one of?) the best out there. 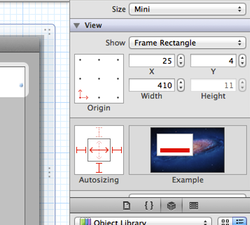 Their attention to detail doesn’t stop at user interface level! 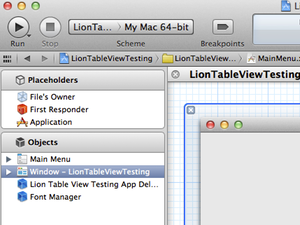 Check LionTableViewTesting2 project for complete code. 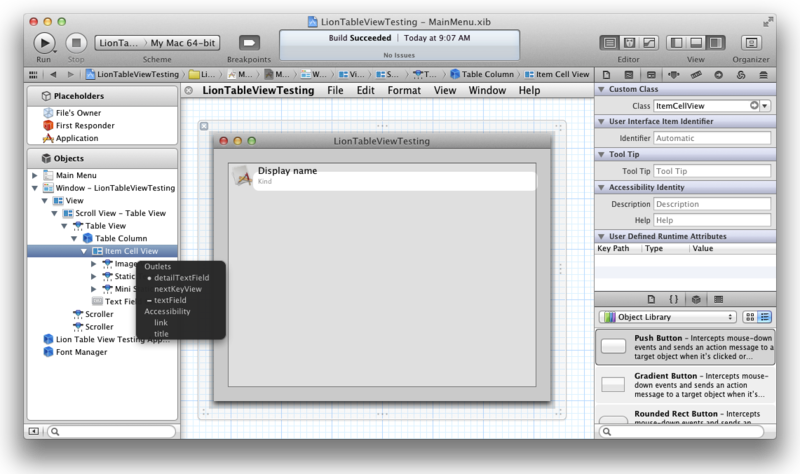 At this point, we can call it a day and ship our new product with mighty powerful view based table views. You might argue that’s barely visible and the text is still very readable, and you’d be right, (most) users probably just won’t notice. But one part of you just can’t accept it, it doesn’t feel right, it doesn’t feel “Mac”. One of the things I noticed straight away after switching to Mac years ago was above mentioned attention to detail. 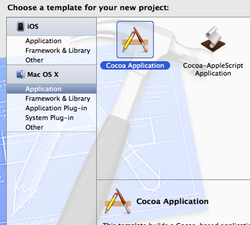 Not only by Apple, but also in indie developers apps. 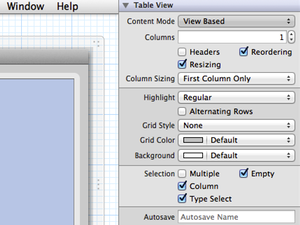 We’d like to have details label text color lighter when selected. It would add that small touch that would make our app more polished. 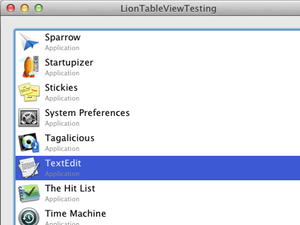 Check LionTableViewTesting3 project for complete code. We could also implement this with custom NSTextField subclass, responding to setBackgroundStyle: method and changing color in there. 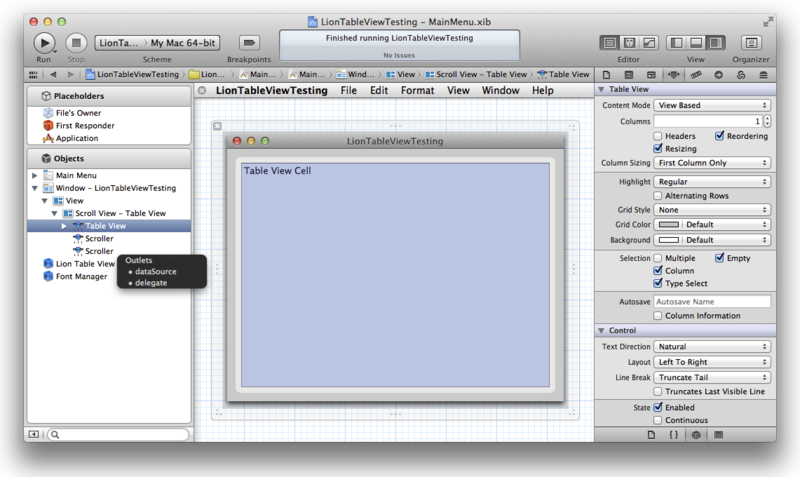 This might be useful if we wanted to reuse the same look and feel throughout many custom table view cells. 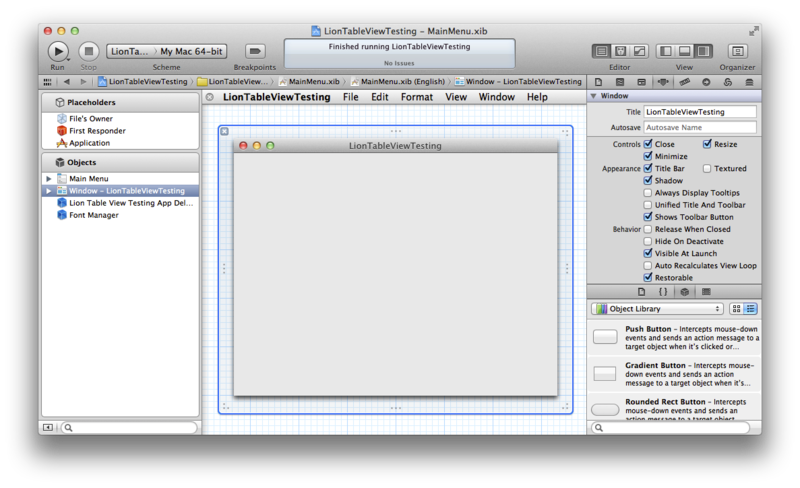 But for most reasonably complex apps, above solution should be good enough. Even though most users won’t notice the color change, the app would “feel” more polished to them too. 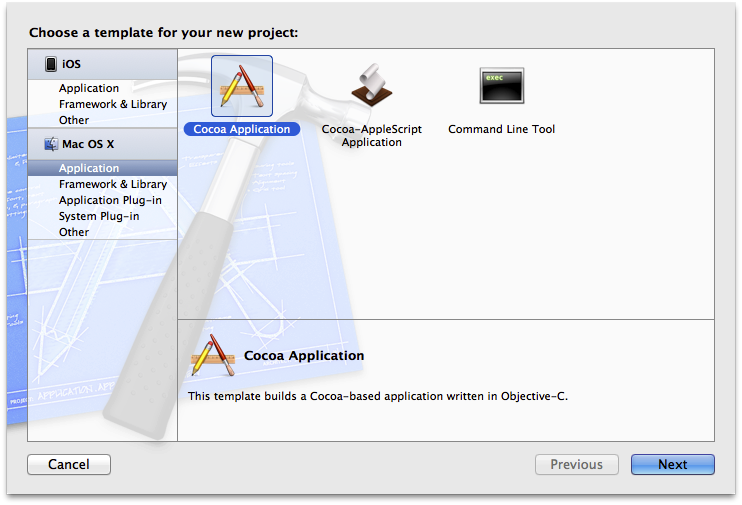 And in contrast with the SDKs I’ve been using for years in other platforms (various flavors of C++, .NET, WPF…), Cocoa APIs noticeably reduce the amount of work required for dealing with “low level” stuff, so we can direct more attention to user interface/experience and polish! 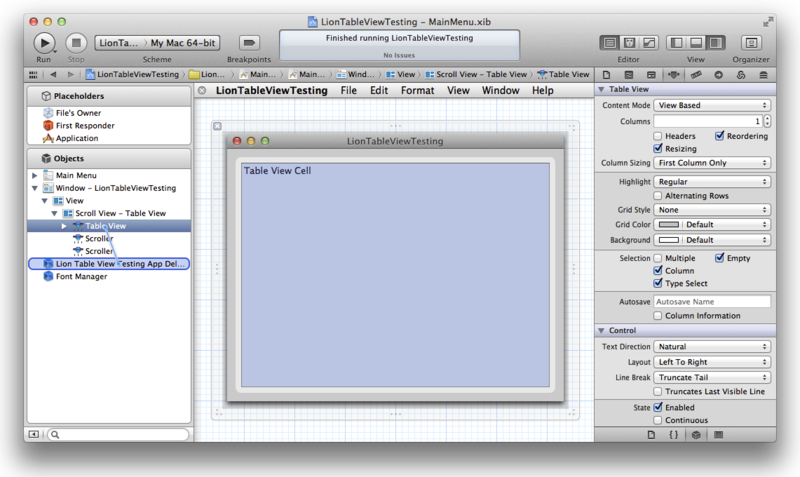 Using view based table views is not that much different from using old-style, cell based, table views, but it provides a lot more customization opportunities. At the same time, you can do much more work within IB which not only provides simpler and quicker way of handling the table, but also requires a lot less code. 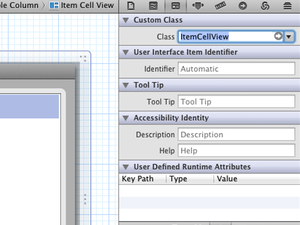 Think of all those custom NSCell subviews and all the drawing code you had to write. 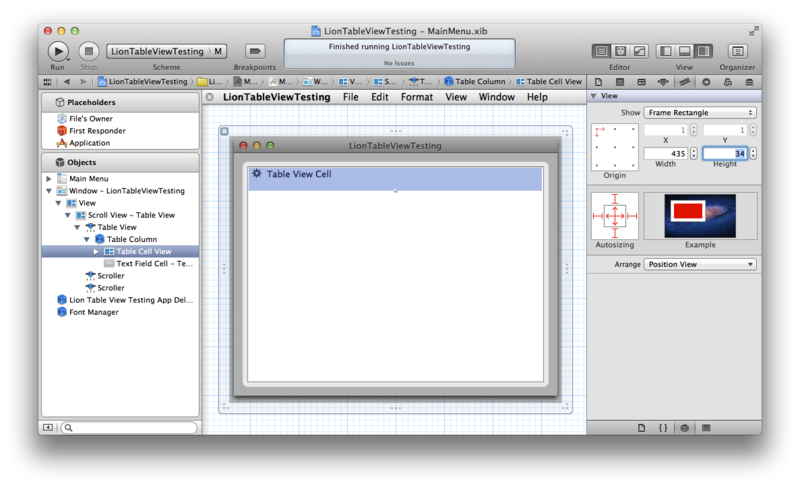 This post only serves as a quick intro, you should definitely check View Based NSTableView WWDC 2011 video and Apple’s table view playground sample code which served as the basis for this post. 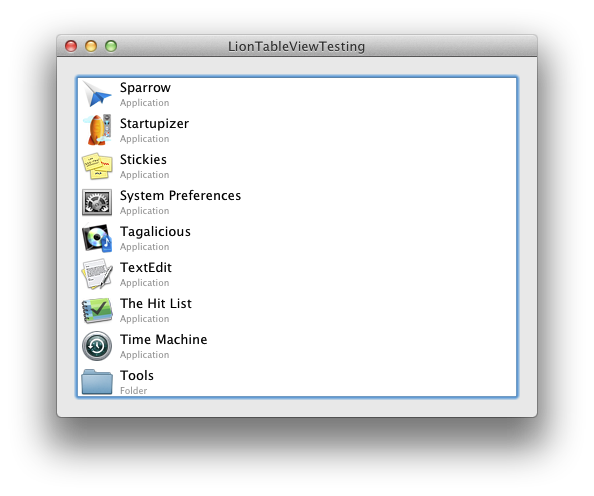 Hope this post will help you get to speed with table views. Hopefully you’ve enjoyed reading as much as I did writing it… In part 2, we’ll take a look at bindings and animated row resizing.